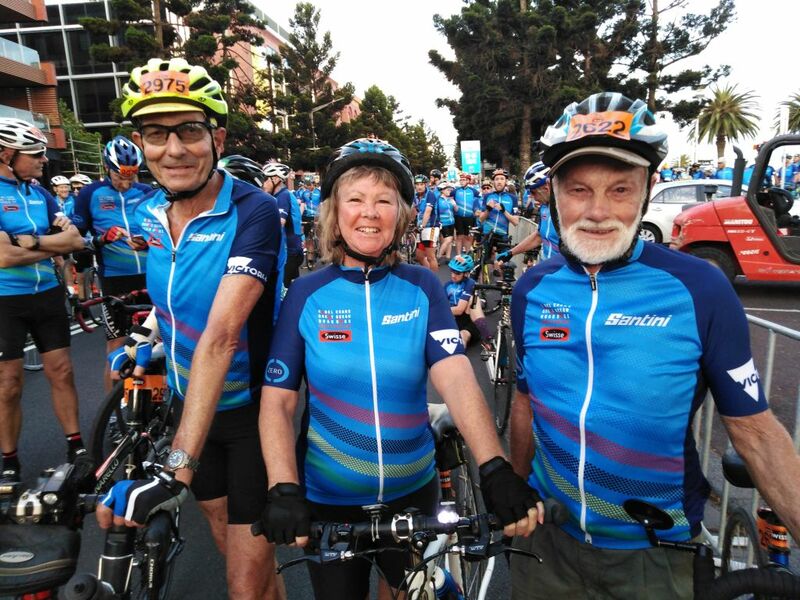 Thanks to Margy for this report and photos of her ride with George and Kevin, and her volunteering for the Elite Men’s event on Sunday. .
With the probable confusion of finding each other amidst 3500 riders, George, Kevin and I rendezvoused in Car Park on Yarra Street, and made our way together to mingle with the excited riders at the starting line. We actually started in a faster group than we had designated, and although it was extremely orderly, I found the pace a tad fast heading into a head wind on way to Barwon Heads. Thanks to my gentlemanly co riders and their support, we made the rest area at Barwon Heads in good time. After skulling a bottle of Lucozade, my legs started turning, adrenaline kicked in and the three of us had a wonderful ride along 13th Beach and home stretch including some fast peddling all along Horseshoe Bend Road. Another great experience to be involved with fellow Cycle Geelong members. Sunday I was a Volunteer for the Elite Men’s Race, which was an eye opener to the organizing of the event. First placement was at car park along Eastern Beach. Quite a serious role with erecting a street barracade sign, and stopping groups of tourists quite insistent on carrying their picnic baskets across the road from the car park to the beach. Next marshall spot was on a quiet stretch of Barwon Blvd, stopping cars from entering from Cedar Grove. An interesting exercise to observe the amount of police, support vehicles and traffic control to run the event safely. Thanks to David Salamy for this report. The conditions were ideal with the cloud cover keeping the hot sun out, whilst the wind was moderate and from a favourable direction most of the time. After our new friends (#675 and #888) stopped for a break, Barry and I picked up the pace and except for a very brief stop so I could open a muesli bar, we hit the Breamlea path. The lead and fastest bunch caught us just as we reached the start of Blackgate Road and boy oh boy were they in a hurry!! It was definitely a race for them as they powered past us slow amateurs! There had to be 50 in the bunch, riding 3, 4 of more abreast, jockeying for position, not wanting to lose contact with the lead pace-setters. Some were over the centre lines with on-coming traffic not far away!! They’re the ones that give all cyclists a bad name! Anyway, we reached Torquay in good time and stopped at the rest area to grab some food and water before having a well-earned coffee at Moby’s. We saw our earlier friends and it turned they weren’t a couple, she was seven years his senior and was in fact his aunt! Pays not to assume anything these days! After a relaxed break we took off for the first of the hills. Our solid training meant that we tackled Jan Juc, the three *itches into Bells and the challenging Jarosite Road hills without any drama. The stretch to Forest Road was fine and once we turned North we had a little tail wind to boost our average. I should mention that Barry has just turned 72 and that I struggle to stay with him on the big hills!! I always had him in my sights on Forest Road but it was only after I had finished chatting to #702 aka Greg, that I found some extra energy to bridge the 50-100 metre gap. So we arrived in Moriac ready for another break and ate or stocked up on fruit, muesli bars, gels and water. I should mention that a nice touch this year was that fifth time riders had their name on their jersey ‘bib’, so it was a bit of fun noting all the names and saying g’day occasionally. I had joked that everyone was going to have DAVID since both Dave Simpson and had that, but ironically, I never saw another DAVID all day!! Whilst we thought that the female numbers were significantly higher this year, I don’t recall seeing any fifth timers. Anyway back on the bike! We were really in home territory now! The Hendy Main and Barrabool Road hills to Ceres were no problem although my new back tyre ‘let me down’ (ha ha get it?) in between. Through Ceres and down into Highton I could sense that everyone was starting to focus on the Challambra/Westbury challenge ahead. No chit chat, being careful with the increased traffic and the Highton roundabouts and getting ready for the hard work ahead, no doubt. All ride I had been careful to not overwork my left hamstring which I had ‘tweaked’ on a fast lap of the river last Tuesday. Heading up Barwon Boulevard I felt a slight cramp in it but it seemed to hold up okay up to North Valley Road, so I kept a steady rhythm and pushed on. I didn’t want to risk standing up on the pedals so Westbury was just a tough grind. I think I counted my pedal strokes up there but what I really wanted to do was swear my way up!! I rolled through the The Ridge calling out to Barry to keep going. 😏 Scenic Road downhill was fantastic but we had to stop at the bridge before doing the Aphrasia and Melville climbs. I did my good deed for the day, giving a first timer and non-local the heads-up about Melville 😇 I think the word is finally getting around about our ‘lovely’ hills because the vast majority of riders seemed to handle them very well this year, with no sudden stoppers 😬 Of course, there were a few walkers, even as early as the hills into Bells. For those interested in the numbers, Barry and I averaged ~26.7 kph. (That was my average after 125kms since I’d ridden from home via Newtown to meet Barry). A big thank you to all the club volunteers for helping to make this year’s ride run smoothly and safely. Also a big thank you to anyone who got out and gave us encouragement along the course, it’s always much appreciated. I had a great day, conditions were perfect. I had planned to start further back than usual this year to avoid being constantly passed by other riders so got away from the line at 07:25. I rode on Boundary Rd with Peter Horan, occasional WoW rider, until South Barwon reserve where I made a quick pitstop. I had a good ride down to Barwon Heads as we had a closed road in the Southerly direction and I managed to keep up a 30-35km/hr speed. I saw Doug along Blackgate Rd until he turned right, heading back to Geelong, and I turned left towards Torquay. Further on I saw Jeff Peck at the Torquay rest stop. Then it was on through the hills at Bells and onto a fast ride up Forrest Rd with a slight tail wind. I saw David Salamy fixing a puncture on Barrabool Rd at Ceres but flashed past and couldn’t stop! Then it was up the final climbs of Challambra, Westbury and Melville and then the annoying sets of traffic lights (all red 🙂 on the way back to the finish line. I managed an overall average speed of 23.5km/hr, slightly slower than last year. I briefly stopped to say hello and congrats to Margy, who was at the finish line, then I headed home to rest! A great day (and I’ve already signed up for next year’s ride). I’ve attached a couple of pics (one taken by Linda Salamy on Challambra). …and I watched the men’s race yesterday at the summit of Westbury. It’s amazing the way the pros ride up that climb! Shame that Caleb couldn’t get the win, he was looking good each time we saw him go past. David Salamy also completed the long course. Thanks to Linda for the photos of David and Dave on Westbury (the last part of the Challambra Climb). Waiting to see my ‘friends’ at the finish, namely Cadel, Max Gawn and Pat Dangerfield. 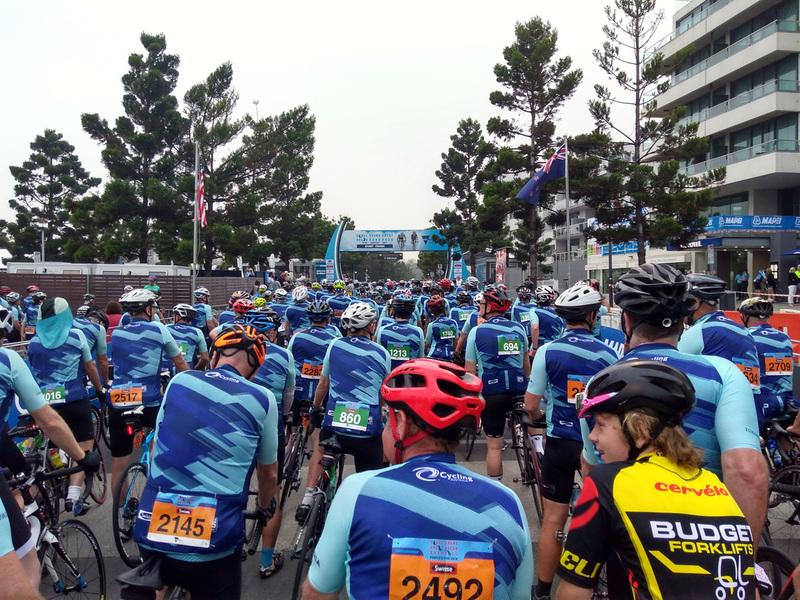 115km ride – the whole circuit of the race, including all the hills around Bells Beach, Barrabool Road, and the dreaded Challambra climb and Melville ‘wall’. I had a good day yesterday, managed an overall avg of 24.9 for the 115km, including the Challambra and Melville climbs. I did the ride in 4 and a half hours of active time. I was doing very well, had an avg of 26.6 at Moriac but the climbs at the end reduced that a bit! We had a bit of mixed wind conditions this year but generally the weather was good. I saw David Salamy at the rest stop at Moriac but headed off again as he was waiting for his buddy to turn up. Dave’s view of the riders in the 115km ride – at the 7am start. Am heading out soon to see the peloton whiz by at Boundary Rd but will head home and watch the rest of the race on TV as it will be too hot to hang around outside to wait for them to do the climbs this afternoon. Pity about that but I just went outside and that North wind is already bring the temp up. There’ll be a few sunburned spectators out there today. “I started at 6:30am with Mike, a weekend riding ‘buddy’. We didn’t push too hard, in order to conserve energy for the hills in the last 60kms but still averaged 26kph for the 51kms to Jan Juc. It was very humid and misty and visibility was quite poor thru my wet sunglasses 😎. After coffee, a good feed and some stretching at Mike’s house in JJ (how convenient is that 😊) we headed for Bells. Our solid training, combined with a very favourable SSE breeze enabled us to do Bells, Forest Road and the hills to Ceres, and arrive in better shape than previous Cadel rides. Now for Challambra! On the climb to North Valley Road there were some ‘early warning cramp signals’, so we stopped for a stretch and then successfully did Challambra/Westbury/Melville before coasting home to the finish. It was a very enjoyable ride, in favourable conditions with terrific support from cheering people all around the course. The atmosphere out on the road was very friendly, the volunteer marshalls were very helpful and there were lots of places to top up our water bottles. All I would like to say I had fabulous fun; happy with my time of 3 hours 20 minutes which included rest stops along the way. My tyre problems started on Friday afternoon when the rear tyre bulged. With the shops shut I could not buy a new tyre. So I borrowed a used tyre from my Son in law. On Saturday morning on my way to the start of the ride that tyre blew out. I then put a patch inside the and fitted a new tube, but I could not put much pressure in the tyre. I made the start ok, but peddling was harder than usual and I could not keep up with Margy. Otherwise the ride was good and the tyre lasted the distance. Thanks to Dave, David, Margy and Kevin for these reports. If anyone else has reports or photographs of their experience over the two days of the Cadel Evans GOR ride and races, please send them in to Helen. Maree led at least 28 members along with friends and family on the river circuit. The weather was perfect. Bill took the position of tail ender, making sure that no-one was left behind. It’s wonderful to welcome family members on the river ride. Quite a few members have entered the Cadel Evans Great Ocean Road Classic People’s ride which is being held next Saturday, so perhaps numbers for the river ride will be down then. Good luck to all riders – whether cycling the short or long course. Entries for the peoples rides have now closed. However, you can still bring children down on Friday 27th, to participate in the free family ride. There are lots of great viewing points along the race routes to watch the women’s event on Saturday 28th, January, or the men’s event on Sunday 29th January. The start and finish line is near Streampacket Gardens. You’ll see many of the cycling stars from around the world, including Chris Froome, the 2016 winner of the Tour de France, and many of Australia’s great cyclists including Richie Porte, Simon Gerrans, Amanda Spratt, and our local hero Leigh Howard. Thanks to Maree and Bill for leading and supporting this week’s river ride. 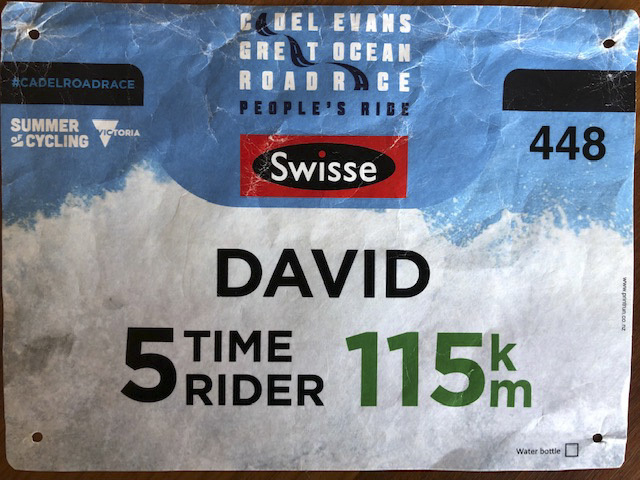 Thanks to Richard for this personal perspective on the Cadel Evans Great Ocean Road People’s Ride and Cycling Geelong‘s Chasing Cadel to view the Cadel Evans GOR Men’s Race 2016. I had not registered, and did not expect to participate. The day before the ride a friend phoned and said her husband was unable to do the ride due to work. She asked if I would ride with her on the day. Although she entered the longer ride, she only wanted to do the 65 kms due to insufficient training. We headed off from my place at 7:45 am and were in time to be in the final two waves to start the ride. It was a perfect day for the cycle. Not too hot, nor windy. We seemed to be passing back markers with relative ease as we snaked our way down the highway. Everyone seemed to be enjoying themselves, as the ‘more serious’ riders were obviously long gone. The route was very flat, and so I didn’t really notice the hills; not so for my friend. She seemed to feel every slight incline and we slowed the pace down for recovery after each rise. When we got to the food stop at Barwon heads, we still had enough time to complete the longer ride, as an official came over and advised we had 5 minuted before the SAG wagon (not bad considering we started almost 1 hour later), however we continued on the shorter ride in the ideal conditions and finished with plenty of energy to spare, stopping to have a coffee at the Quality Hotel on the Esplanade (Best coffee in town). On the Sunday ride, Doug and I did the Chasing Cadel – with a few alterations, which had me glad I hadn’t done the longer people’s ride. No granny gear meant my legs were burning up, while Doug was merely having a Sunday stroll! We managed to see the riders in Barrabool Road, and at Moorabool Street Bridge, later at Carr Street as they turned onto Moorabool (the pack were really stretched out at this, the third cycle of the circuit). We headed to the finish line, where we caught the end of the race, and having spoken to Leigh Howard’s Mum at Barrabool Road earlier, it was great to see him come in second place on the day. It was also a bonanza for Geelong. The sun came out later in the race, and the images must have been great, with our beautiful sea front vista. The rowing regatta was on at the same time, so hopefully Phil Liggett gave us a good wrap. Last year I did the short, 68km Cadel People’s ride so this year I decided I had better do the ‘proper’ 114km ride. I rode to the start at Eastern Beach from my home in Leopold and the crowd at 6:45 am was already huge, a sea of yellow. I had arranged to meet my friend Joe and his family to ride with but due to a communications problem we didn’t line up together. No matter, I thought we could meet up further down the road, more on that in a minute. I set off at 7:15 and it was easy riding, no wind to speak of, and I got down to Barwon Heads pretty quickly and stopped at Annie’s for a coffee. I had sent Joe a few texts to try to meet up but as it turned out he was actually way down the road in front of me and had not stopped for a break. I was just putting my bike into the rack in front of Annie’s when who should turn up next to me but Joe’s wife Kylie. She was riding the short route with a friend so I was able to share coffee and some delicious food with them. Setting off after our stop we had the pleasure of riding along 13th Beach Rd, closed to traffic and no cross wind, highly unusual for that part of the world. I said goodbye to Kylie and pressed on towards Horseshoe Bend Rd toward Torquay. There weren’t too many riders left sporting the black numbers indicating that they were doing the long ride and the marshal at the Horseshow Bend left turn yelled at me that I’d have to push to avoid the route cutoff time. 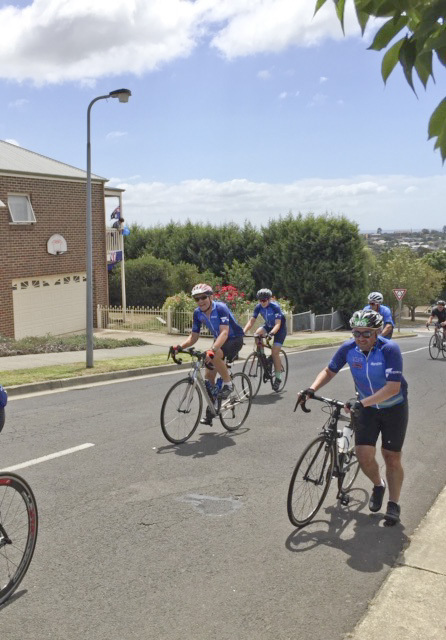 So I picked up the pace and once through Torquay and heading to Bells came upon lots more riders who were grinding up the hills on Jarosite Rd. My recent course of lessons on the spin bike came in handy to help me cruise up the hills and make up time and I was soon riding along Forrest Rd heading torwards Moriac. I had a brief stop at Moriac to fill up the water bottle and grab some of the free energy bars. It was a great day to be out riding the bike and I was soon on Hendy Main Rd going up and down the rolling hills. Suddenly a car went past with two of the Dimension Data team riders following. I tried to catch up to them to wish them well for the race on Sunday but there was no possibility to catch them, and they were just on a training ride! Then it was on to Barrabool Hills Rd. I had ridden this very recently with both the Wheels on Wednesday group and on Shane’s Barrabool Hills Classic so I knew what to expect and was able to cruise along pretty comfortably. Soon it was up the climb on Scenic Rd and then down and across Queens Park bridge and then up the dreaded Melville Ave ramp. I managed to stay on the bike, in my ‘granny’ gear and out of the saddle and once over the summit was able to relax and speed down the hill towards the finish kite. I looked down at my GPS and was amazed to see that I’d achieved a moving average of 24km/hr over the 114km route, so I was pretty pleased with myself. Just then I got a text from Joe who had seen me riding down Church St while he was riding up to where he was staying in Hamlyn Heights. He invited me up for lunch so it was back on the bike to ride up Church St again! The marshals were getting ready for the arrival of the riders in the Women’s Elite race but they let me through and after lunch I was able to see the race from the top of Hyland St, at the cement works. Then it was off around the Barwon River track towards home. I ended up riding 155km, my average cadence for the day was 78rpm I and had a great day. I’m definitely signing up for next year’s ride! …and I got a very nice yellow jersey to wear when out riding with Cycling Geelong! Editor’s Comment: Dave’s recent training has paid off. As well as rides on the road and with the MTB, he’s now taken to beach riding with his new ‘fat’ bike. Today, just to warm down from Saturday, and with a couple of rides in between, Dave rode 109 with Wheels on Wednesday. Well done, Dave. Cycling Geelong members cycled 48,156 km on club rides in 2017. 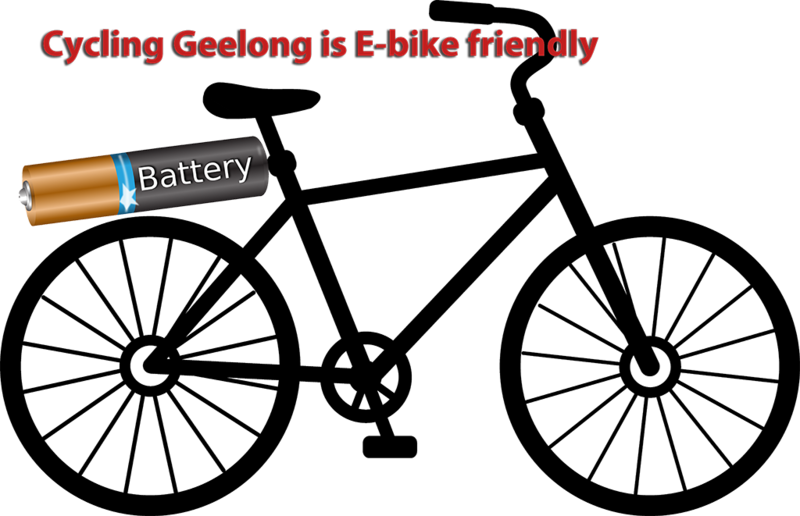 To January 11th Cycling Geelong members have cycled 6474.08 in 2018. Bike the Bay Too wet to cycle? Go for a virtual bike ride around the shores of Corio Bay. Copenhagenize: Cycling friendly cities Copenhagen is the world’s leader in cycling infrastructure. This site showcases the best and analyses the worst. The Bicycle Show 94.7 The Pulse The Bicycle Show is aired at 11am each Saturday on 94.7 The Pulse Community Radio. Cycling Geelong’s Heather Howard and John Miro are presenters. Podcasts are now available of each week’s show. .